3, 2, 1 ... Liebe! Weapon H heads to Weirdworld! 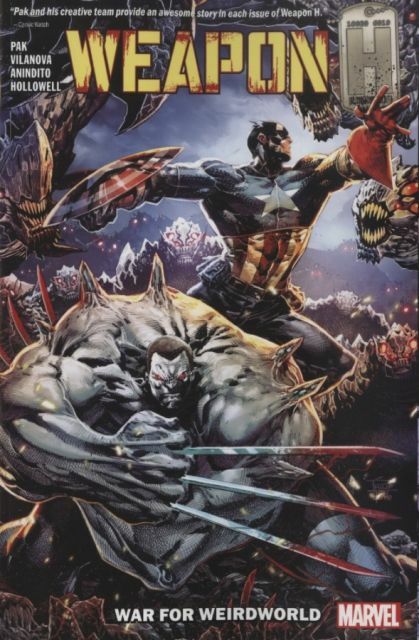 Weapon H joins Captain America in battle against the Skrullduggers! What the heck are they? Why, dragon-monsters with Skrull shape-shifting powers, obviously! But what have they got to do with Roxxon? And are they from outer space - or somewhere far worse? With allies including Korg, Man-Thing and Titania, our hero is in for the trip of a lifetime to the Marvel Universe's most far-out locale - but its ruler, Morgan Le Fay, won't be happy to see them! And she certainly won't like Roxxon's plans for Weirdworld! With a deadly sorceress on the rampage, it's time for Clay and his team to cut their losses. But the ever-bullish Dario Agger isn't about to lose a profit - and Weapon H will have to bear the cost! Collecting WEAPON H #7-12. Diesen Artikel haben wir am 28.03.2019 in unseren Katalog aufgenommen.